Now you can spend every day with Peter and his siblings, Flopsy, Mopsy and Cottontail (though hopefully not Mr McGregor!) during meal times with this 5-Piece Beatrix Potter Flopsy Organic Dinner Set, designed with gorgeous illustrations from the original Peter Rabbit book. 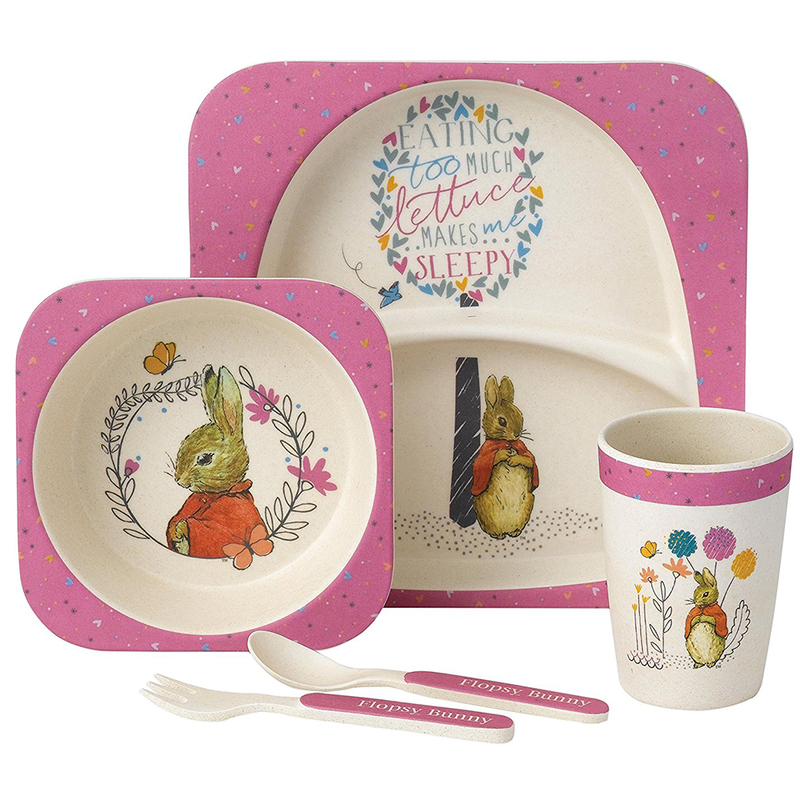 Complete with a mug, a bowl and plate with matching knife and spoon, this set is made from bamboo fibre and it’s toxic-free, biodegradable and eco friendly, while looking almost as fresh and natural as Flopsy herself. She’s the star of this dinner set in her beautiful pink jacket in a field of flowers. Each piece is also designed to be top rack dishwasher safe, making cleaning up a breeze. So whether you're serving fruits, soups, juice or carrots on their own, delight the mischievous bunny in your life by introducing them to Peter, Flopsy and their gang! Toxic free, biodegradable and eco-friendly. Presented in a Beatrix Potter gift box for girls. Original illustrations from the book featuring scenes with Peter Rabbit’s family.